Years ago when Anneli Adolfsson was studying to be a medical scientist in her native Sweden, little did she know that some day she would create a pet loss and bereavement counseling service. But that’s exactly what happened when her once-in-a-lifetime dog Angel went to the Rainbow Bridge. ” It opened my eyes to the tremendous need in the community, the stigma attached to mourning the loss of a pet and the isolation many people face during that difficult time,” she writes on her website, AngelPawPrint.com. Thanks to Angel, pet loss now has a voice as Anneli helps pet parents with bereavement counseling, hospice care, after care arrangements, tributes and everything else that helps a pet’s memory live on in dignity and love. Offering her services in three different countries, Anneli calls it “Love and Bereavement without borders.” Today we’ll talk to Anneli about the unlikely path she took to get to where she is today, and also learn tools for coping with pet loss in all its many forms. 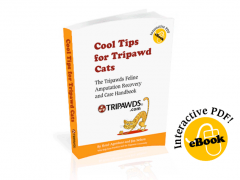 Learn many more tips to help you threough your entire Tripawd Journey in the Tripawds Community blogs, discussion forums, live chat and many other free support resources. 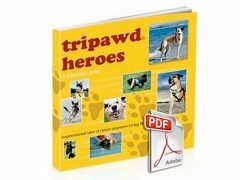 Why Traction Is Important for Tripawds, and How You Can Help!